The makers of Peaky Blinders have sent a warning to an unofficial Peaky Blinders bar in Manchester. The theme bar, music venue and dim sum restaurant has photos of characters from the hit TV drama on its walls. But the 1920s crime drama's producers said it "has no authorisation to use the Peaky Blinders television brand". 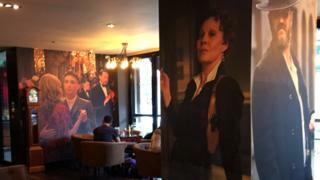 The bar owners said they were fans of the Bafta-winning drama and "do not in any way intend on portraying ourselves as being affiliated with the show". Peaky Blinders was named after a gang that ruled the streets of Birmingham in the 1920s, and the fifth season will be on BBC One later this year. The show is made by Caryn Mandabach Productions and Tiger Aspect Productions. The producers said: "The bar has no authorisation to use the Peaky Blinders television brand, and in line with our strategy to manage such infringements, the owners have been contacted with a legal notice to cease and desist. "We work hard to protect the quality and authenticity of the Peaky Blinders brand and work only with approved partners to ensure that the show's dedicated fanbase receive quality experiences and products befitting the high standards of the show." The bar's owners said both sides were in discussions about any necessary changes. They said in a statement: "We are a fan-based theme bar from the 1920s era. We base ourselves on the Peaky Blinders tradition of community spirit and togetherness with a feel good factor. We are trying to create that image and that image only. "If we have offended anybody, that is not intended, and for that we apologise. "We enjoy the Peaky Blinders series as fans and do not in any way intend on portraying ourselves as being affiliated with the show or Tiger Aspect Productions. We're just fans of the past and present." Caryn Mandabach Productions has registered the phrase Peaky Blinders as a trademark for use in relation to television shows, among other things. But an application by the TV company to trademark the name for uses relating to bars and other food and drink services has been opposed, according to the government's Intellectual Property Office.